Matt Marks, a founding member of the contemporary chamber orchestra Alarm Will Sound. 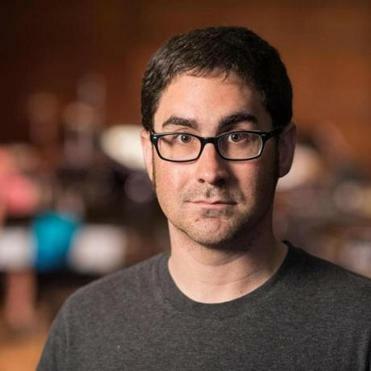 NEW YORK — Matt Marks, a composer and musician who was at the epicenter of a diverse community of open-minded artists as a founding member of the contemporary chamber orchestra Alarm Will Sound, died Friday in St. Louis. He was 38. The cause was heart failure, said Mary Kouyoumdjian, Mr. Marks’ fiancee and also a composer. Mr. Marks, who lived in Brooklyn, had just performed in St. Louis with Alarm Will Sound, she said. As a performer, Mr. Marks was known best as a French horn player for Alarm Will Sound, of which he was an integral member. The ensemble has been critically praised and is known for its unusual stylistic breadth and commitment to innovation. When the group ventured further into theatrical concerts and multimedia events, he rose to the occasion as a singer, an actor, and a keyboardist. He also contributed one of the group’s signature pieces: an eerily accurate arrangement for live performers of “Revolution 9,” the notorious 1968 musique concrète sound collage recorded by The Beatles. Alarm Will Sound’s versatility and commitment to stylistic diversity ideally suited Mr. Marks, whose work as a composer showed similar range. In both concise concert pieces and sizable stage creations, such as the operas “The Little Death, Vol. 1” (2010) and “Mata Hari” (2016), he demonstrated a knack for crafting works of substantial appeal and subversive cheek, generously endowed with sharp wit and relatable pathos. His compositions demonstrated his compatibility with pop music’s stylistic palette, production effects, and emotional affect. Mr. Marks was also known as a community organizer. In 2009, he was among the founders of New Music Bake Sale, a fund-raiser, concert, and social mixer. The event proceeded from the notion that rather than competing for limited funds and audience, New York’s independent new-music ensembles could band together to emphasize common bonds and goals, while increasing visibility for the entire scene. Motivated by similar notions of mutual regard and strength in numbers, Mr. Marks was among the founding organizers of New Music Gathering, a festival and conference that brings together performers, composers, academics, journalists, and others from around the world for concerts, lectures, topical discussions, and networking. In addition to matters of aesthetics and economics, the event was conceived to address social and political issues, such as access and inclusiveness. First presented in San Francisco in January 2015, the New Music Gathering has recurred annually in a new city each year; the 2018 event will begin on Thursday in Boston. Mr. Marks’s death touched off a flurry of social-media posts that attested to the art he made, the organizations he helped to establish, and the values he championed. The tide of posts was also a reflection of the oversize personality he cultivated online, particularly on Twitter: goofy, gregarious, provocative, self-deprecating, and equally happy to discuss powerful musical experiences and trashy horror films. In his online commentary, Mr. Marks confronted instances of institutionalized discrimination or aesthetic snobbery with caustic wit; mostly, though, he espoused a worldview animated by optimism, generosity, and boundless curiosity. Other ensembles with which Mr. Marks performed included the International Contemporary Ensemble and Wordless Music Orchestra.